They tower over commuter cars on the freeways and surface streets often moving along at 65 miles per hour. These hulking behemoths are the workhorses of our economy and transport goods between businesses and railway or shipping yards. A semi-truck is nothing to mess with and can cause extreme damage in any number of incidents including jack-knifes, roll overs, fires or fender benders that can instantly turn catastrophic. The weight and speed of a semi-truck creates a potentially lethal amount of force. For this reason, drivers are regulated and specifically licensed. 1. No zones – There are three areas where the driver has blind spots: Side no–zone, rear no–zone, and front no–zone The right-side blind spot is doubly dangerous because trucks and buses make wide right turns! 2. Merging – Getting on and off the freeway is when most drivers interact with a semi-truck. Just give them space – Semi-trucks need time to turn and react. 3. Turning right – Semi-trucks and buses need extra space for wide turns. 4. Changing lanes – Don’t cut off a semi-truck to change lanes, the driver may not respond in time and their breaks are not as responsive with the weight they carry. 5. Blow-outs – Tires wear and can sometimes blow out. 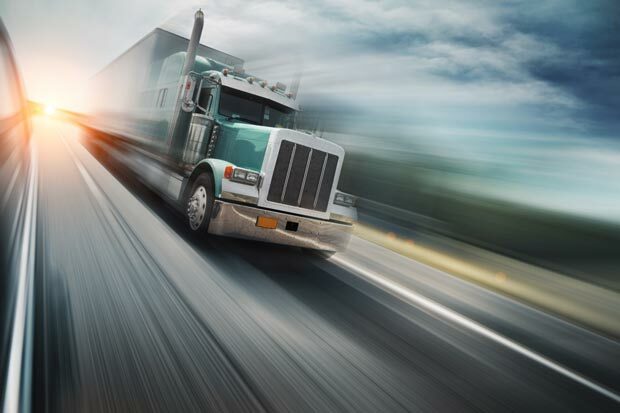 If you find you are next to a semi-truck for a long stretch consider speeding up or slowing down to not be directly next to the wheels for a prolonged time at high speeds. 6. Covered loads – Even the best-packed loads can sometimes come free. Be sure to give yourself enough space to avoid debris. 7. Winds – If high winds are present a semi-truck may roll over going 65 mph while carrying 12,000 to 80,000 pounds of cargo. 8. Road rage – Avoid being rude to semi-truck drivers, they are on the road for their living and want to have a smooth drive. Consider how much they have to deal with on a daily basis and give them the benefit of the doubt. 9. Driver error – This is the number one cause of all accidents and is no exception to semi-trucks. Stay off the phone, get sleep and do not drive under the influence. 10. Bottom line – Drive carefully and cautiously around semi-trucks. If an accident does occur, contact Harshbarger Law. If you are a professional driver or a commuter that has been involved in an accident with a semi-truck it is important to have legal representation. Harshbarger Law understands the importance of recovering quickly from a semi-truck accident. Harshbarger Law is not only on your team, we’re the team captains. Many law firms claim to be on your side of the table. Some even go so far as to be transparent in their process. At Harshbarger law, we aren’t just on your side; we are the loudest and fiercest part of your team. Our top priority is fighting for your rights and your recovery. By retaining the experienced personal injury attorneys at Harshbarger Law following your semi-truck accident, we immediately begin focusing on the logistics of your case while keeping you free to focus on your recovery. We will be able to accurately assess any implications or consequences you may be dealing with for the rest of your life as a result of the event and will be able to get you the full compensation you are entitled to in accordance with the laws. At Harshbarger Law, we handle all auto accidents and personal injury cases on a contingency basis, which means we don’t take a fee unless you are compensated. To learn more about how we can help you or a loved one in stressful times following a car accident, please call Harshbarger Law today. This entry was posted in News, Personal Injury and tagged Law, Personal Injury, redlands, San Bernardino, semi-truck accidents. Bookmark the permalink.